"Oooh, I just HAVE to get one of those!" 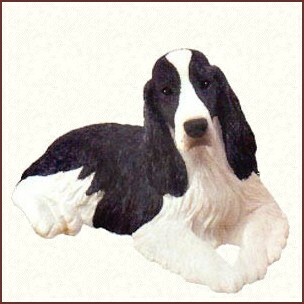 Whether you are an avid collector of English Springer Spaniel items, or simply in need of a prESSent for a Springer-loving friend, Nanjay may just have that special something you've been looking for. 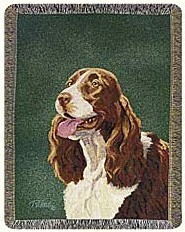 We like to think of these gifts as ESSentials for the Springer enthusiast! 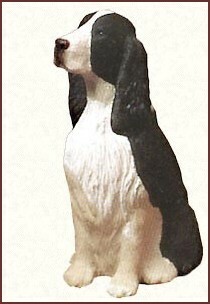 Sandicast is the premier manufacturer of cast stone animal sculptures. Each piece is designed by Sandra Brue, hand-cast and hand-painted. They virtually come to life with the addition of sparkling glass eyes. Sandra's artistic goal is to always capture the realism and inner spirit of each animal. She never compromises the integrity of an animal for the sake of being commercially "cute." Beds sold separately (wicker, with foam pad & fabric cover). Matching throws, pillows, and footstools. 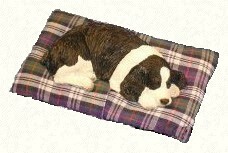 The throws are 100% cotton and machine washable. 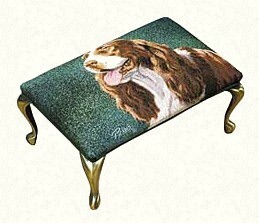 The footstools and pillows are made from beautifully detailed tapestry and the rugs are a polyester, acrylic and cotton blend for durability and stain resistance. 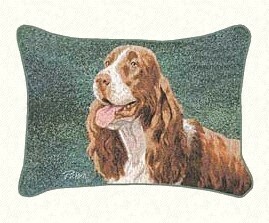 Blankets, Wallhangings, Couch or Chair Covers. 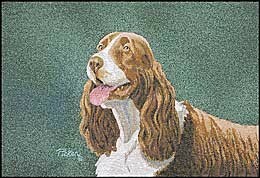 Please Note: We attend gift shows and the 'One of a Kind Show' in Toronto every year, so we usually have a variety of Springer items and calendars on hand, for our Nanjay boarding and grooming clients, family and friends.